This Green Rice dish will certainly surprise your. 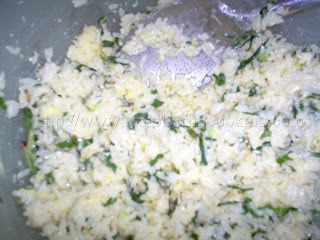 Rice is a staple ingredient in many dishes here in Trinidad. Trinidadians do eat a lot of rice. It is considered a basic food, despite its ever increasing cost. What is important is that we do not waste this necessary ingredient. Some times I get a little tired of eating plain rice with whatever side dish. That is why I like green rice, but don’t let the name fool you. The rice is not green, that would be weird though. 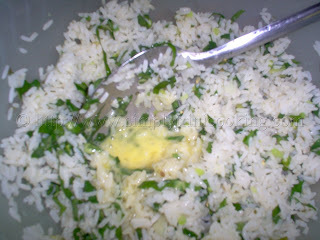 The rice is called by that name because it is cooked with dasheen leaves (taro leaves), which is green of course, and some other green herbs and seasoning. And yes, it has lots of cheese… This is a tasty pie that everyone will love. It also makes a great vegetarian dish. Some of my favorite side dishes with this dish is callaloo (yes, I know more dasheen), stew chicken and lettuce salad (more green again!). This dish is very easy to prepare and fuss free. 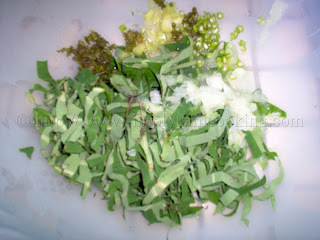 But before I give you the recipe, don’t forget to cut out the tips of the dasheen leaves (or else it will itch you) . 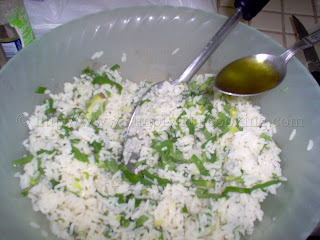 Here is Green Rice… Hope you enjoy this tasty dish! 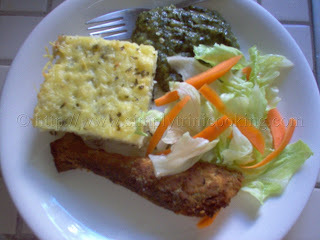 Green Rice with callaloo, lettuce salad, and a piece of fried fish. Cook the rice, ensure that it is still somewhat grainy. Cut off the stalk of the dasheen bush. Retain the leaves and remove the tips of the dasheen bush leaves. 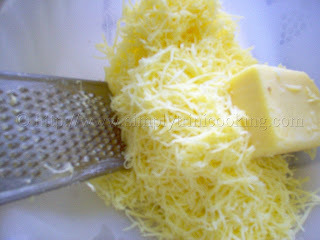 Gather all together and slice thinly, as shown above. 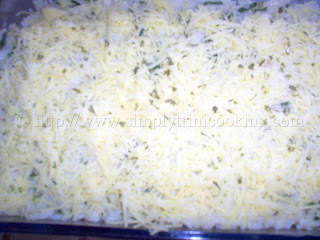 herbs, salt, pimento, onion, egg, butter, milk and 3/4 of the cheese. Mix well. until the top of the pie is golden brown. This dish was worth it; fuss free with a whole lot of cheese. If Emeril was doing this dish I could just hear him say “Bam!!”. Anyhow, good luck and good cooking! Enjoy your green rice. Very interesting. I get tired of plain rice as well. This sounds like a great dish. Dasheen leaves are hard to come by where I live. Can I substitute vine spinach? Or is the regular bhaji better? Dasheen leaves get soft when cooked. If the vine spinach does the same, then it is a good substitute. I used spinach and it was just great….